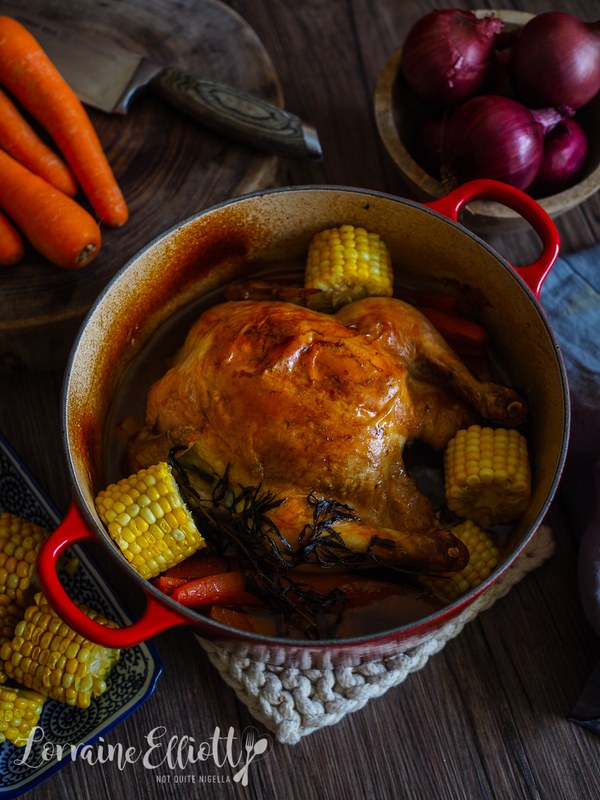 Fowl Play: The Easiest Chicken Pot Roast! Nothing is easier to make for dinner than a pot roast. 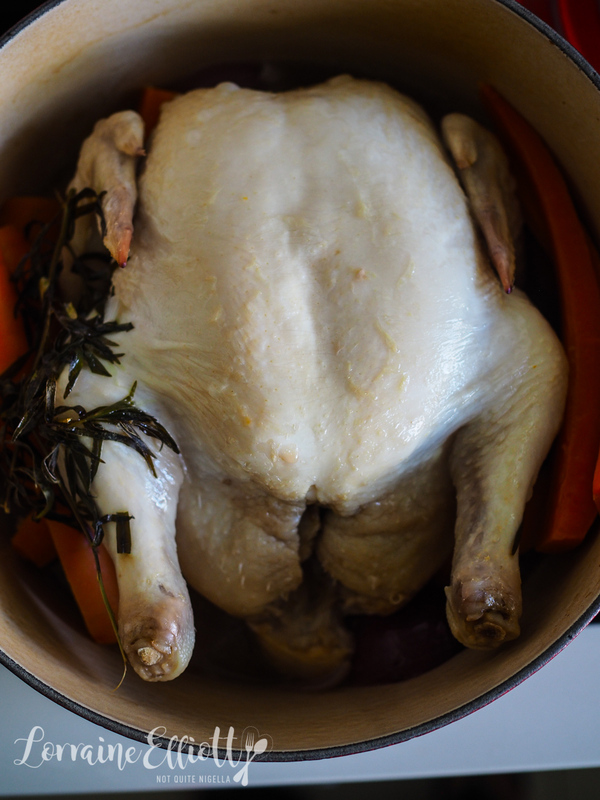 Here a whole chicken is roasted in white wine, chicken stock, onions and garlic so that it is crispy on the top but wonderfully juicy inside. Best of all it takes about 10 minutes prep! When I showed that I was making this on my Instagram stories, I got so many messages about this simple roast chicken. The thing about this is that the chicken really steams for an hour in the pot but then gets it's final bronzing simply by removing the lid. The juices concentrate and you've got tender carrots, polka dot corn cobettes and all the makings for a complete meal. I tend to save this sort of dish up for days in which I am low in energy and this actually lasts for about 3 meals for just the two of us. Ever since Mochi passed away there have been quite a few days where I haven't had the urge to cook but know that we need to eat wholesome good food. For the past six weeks I've been relying on my friends and family. Ivy did all the taxidermy arrangements for Mochi including finding a great one and picking up her body (I couldn't bear the thought of never seeing her sweet little face ever again). Nina came over and brought flowers and sweets and visited a few times, Monica made a donation to the RSPCA so we could become another dog's angel, Celia and Pete invited us over for dinner, Mr NQN's work observed a minute of silence for Mochi and Girl Next Door who is a new celebrant also offered her services for Mochi's memorial. And that's not even including the amazing gifts and notes from readers which I'll share with you in another post. My parents are a little different from others and while they're not the demonstrative type they show that they care through food. A couple of nights after she passed they invited us over for dinner and ordered my favourite food. And then a couple of weeks later I got a message from my mother. "Are you home? We are coming to your house in about 16-20 minutes to see you. We bought lunch for you," she said. They were holding a big container of won ton soup and my favourite chicken and ham rolls and noodles. 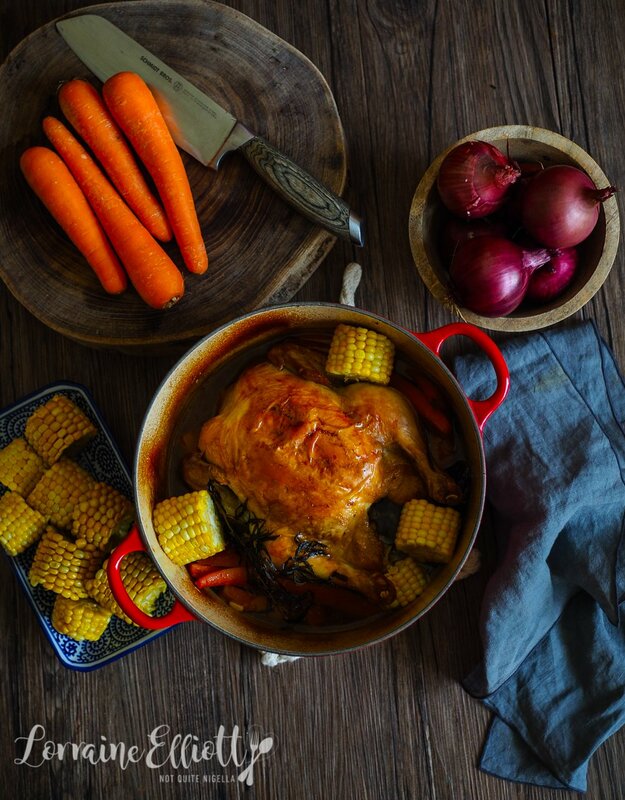 I had this chicken in the oven and it smelt delicious and it was a toss up what to eat. So save this recipe for days when you don't have energy where quartering carrots is the most you can do. Or when you can't get dinner delivered to you! So tell me Dear Reader, do you make dinner every night? How often do you feel low in energy? Step 1 - Preheat oven to 160C/320F. 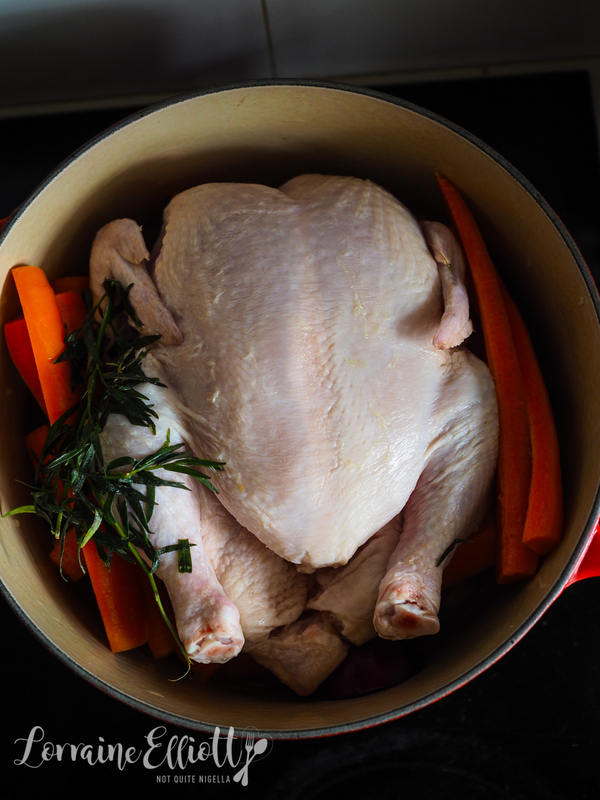 Place the onions, garlic, carrot, white wine chicken stock in a large cast iron pot with a lid. Place chicken on top breast side up and place the lid on making sure that the top of the chicken doesn't touch the lid. Bake with the lid on for 1 hour. Step 2 - Remove the lid and increase the temperature to 190C/384F. 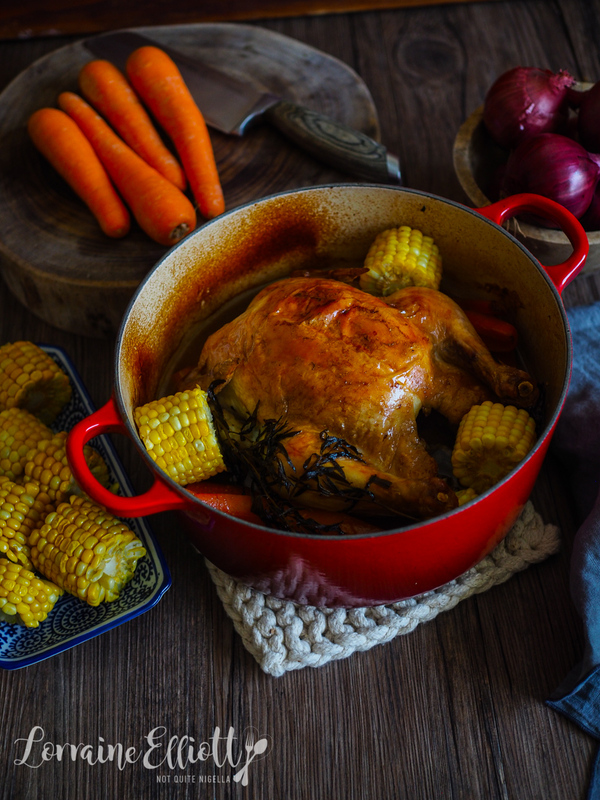 Add the corn to the pot and submerge the pieces and spoon some of the juices on top of the chicken breast and bake for 50 minutes to 1 hour until chicken breast is golden. You can baste this a couple of times in between but really it doesn't need it. Season with salt and pepper. Tip: The sauce makes the most wonderful gravy. Drain off the liquid into a small saucepan and heat until simmering. Mix 2 teaspoons cornflour with enough tap water to make a slurry and then mix into the gravy stirring or whisking until thickened.